In resort you have total peace of mind knowing that our Director, Michel, is on hand each and every day to watch over the Ski School for both the adults and children. At the end of each lesson he is there to talk to the instructors and liaise with parents should there need to be any movement between classes. 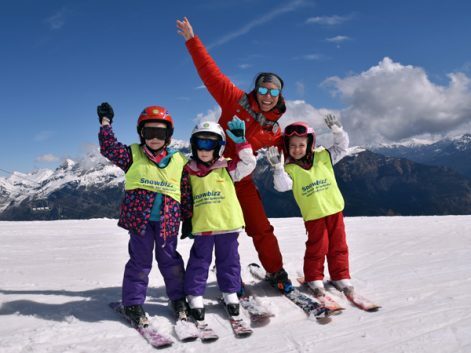 We know that watching your children learn to ski for the first time can be nerve wracking but Michel, our Pink Ladies and instructors are there to make it as easy as possible. Should there ever be any problems each instructor takes out a radio to keep in touch with Michel throughout the 2 hour lesson. We’re there to listen to any concerns or any tips on what works best for your child so that they can get the most out of their ski lesson and holiday. Puy St Vincent is great for all the family as there is truly something for every skiing level but it really is a fantastic resort to learn to ski in. Our youngest skiers – our Totons (typically aged between 3-5), are based in our garden which is located directly next to the Sun Vallee Residence, so is easy walking distance to go and have a sneak peak on how the lesson is going. For our Juniors (typically aged 6+) when learning to ski they’ll start in the garden and then progress onto the green and blue runs. With Puy being a smaller resort it allows for parents to bump into the ski groups so you can see their progress first hand on the mountain. I’m sure there are many parents who have photos or videos taken from the Log Cabin whilst enjoying a vin chaud as a ski group whizzes past after coming off the 6 man. When interviewing for our resort team we always ask ourselves, ‘Is this person ready to go the extra mile? Do they have a genuine love for working with children?’ as we want the very best at Snowbizz. We want our team to enjoy their season experience, but we also want a team who are there to make every families holiday a fun and memorable one. We often have a lot of families who are leaving their children in a creche for the first time which we understand can be daunting. Our qualified nannies are there to help stop any tears and make their creche time fun and exciting. One of our new guests this year told us, ‘Our boys have a hard time saying goodbye to us at drops-offs and by the middle of the week they both were running in the creche!.’ If you’re ever feeling nervous leaving your child or children, our team can always send you a quick text letting you know how they’re getting on. In the mornings our Junior Ski Reps and Nannies will have a range of games and activities to do before and after your child’s lesson. Afternoons in the creche are varied with a different theme each day. After the skiing day is over we have a Kiddie Club every night (for children aged 5+) ranging from a Pizza Party and Talent Show to Snowfun and the end of the week Disco. We know that sometimes children like to know who they’re going to be with and can feel anxious with new people. So for the next winter season we’ll be doing a short video in our training week introducing our team to you so you can show them who they’ll be with on holiday. Sarah and Jo in the UK Office are on hand to help with all your questions during your booking. They always make sure to pass on to our resort team any information you’ve told us which will help make your holiday run more smoothly. If your child is nervous or has had a bad experience learning to ski before, we make sure our Resort Director, Michel, knows so he can pass this onto our instructors to help make the learning experience as stress free and easy as possible. Our goal is to take the stress out of going on holiday as a family and to ensure the holiday is memorable for everyone. We know that as a parent you can feel anxious watching your children first learn to ski, but with our team of Pink Ladies and ESF instructors, we know not only will they learn to ski but they’ll have a great time doing it. So many parents over the years have said to us that ‘as long as the kids are happy then so are we’. We hope that when parents start picking up happy children from ski school and creche that they can start to relax. The best part of watching your children learn to ski? When they start to show you how you should snow plough, parallel turn or even do ‘cool’ tricks that they’ve learnt from their instructor. After 30 years of Snowbizz we’ve been fortunate enough to get to really know a lot of our guests. We love nothing more in resort or in the UK office than hearing stories from you about your holiday with us. This year we had a lovely film crew from Studio 8 go out and capture what a typical holiday with Snowbizz is like. We can’t thank them enough as it really does perfectly show what we’re about. Take a look below and we hope it makes you smile just as much as it did us. Snowbizz gave us some great memories of our holidays in PSV, the wonderful team who looked after her and encouraged her skiing at 3 years old. She has represented Team GB for last 8 years and now at 18 years old is GB U21 alpine ski racer. Thanks to Snowbizz she loves her sport.